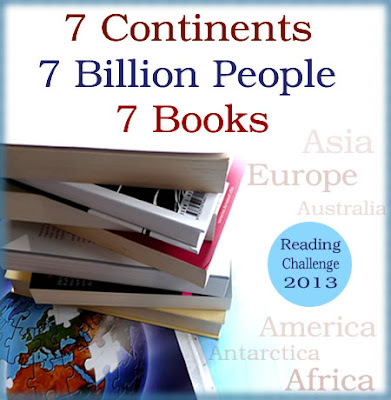 The idea of this reading challenge is to explore the world by books from different continents and countries, and by visiting various world lists while planning the reads, to encounter the one or other unknown angle and fact about our world. The idea for 2013 is to continue with the global reading and exploring from 7 new, interesting angles, including some trends of our modern civilization. Why 7? To keep it simple and playful, and leave space for extra reads that might be inspired by the lists. Also, with 7 continents, and the world population reaching 7 billions, the 7 seems to be the best number for this kind of challenge. Below are some more details to the country categories, with links to country lists. The sorting of the 7 lists is just a suggestion. When picking a country, the idea is to also pick an author from that country. If that turns out to be difficult, try to find an expat author who lived in the country for a while. Here are the 7 country categories, with links to the global lists, and with the top 7 countries listed already. 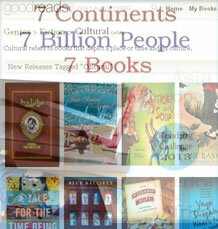 For each category, pick a country from the top 7 list, and then pick a book from that country. The lists mostly are wiki-lists, as those often offer addditional search options. It's an own challenge to create a definite ranking of the oldest countries of the world, which makes this question interesting in its own way. Some references: About/Geography and here: Wiki-answers. Fallen Words by Steve Wing @ hobnailballet: "Getting a jump on the reading challenge, and also exploring graphic storytelling, I read a Japanese book, “Fallen Words” by Yoshihiro Tatsumi. It is a remarkable dunk in another culture, which I know is one of the objectives of the challenge..."
Island Reads by Dorothee @ life as a journey: "I am still on Lanzarote island, and brought some world books as prelude for the world reading challenge. So it's in Spain that i read my first book from South Korea, and a novel from Marocco..."
Hey, it's only been a year by Maggie @ Urban Living: "I’m joining the “7 Continents, 7 Billion people, 7 Books” reading challenge for 2013. My plan is to shop my bookshelves for candidates–I definitely have many that fit the categories that have been collecting dust." The Reading Challenge Edition by Nupur @ One Hot Stove: The end of the year is also the time to sit down and do some delicious planning for 2013. I've never done reading challenges before but they sound like fun, and I'm signing up to do 3 of them in 2013. Go big or go home, right? great idea; can't wait to begin; I'll have to fill my xmas stocking with related reads! Thanks, Jane, for letting me know about this. Sounds like a great challenge. I'm in. It might even prompt me to update my blog once in a while. hi Jane, hi Maggie! Thanks for joining the challenge right away. I'm excited about it, too. Will be interesting to see which books everyone comes up with. Hi Steve, hi Tanya! Thanks for joining. So great to see the group grow. One of the ideas really is to get more of an understanding for other cultures, and also: to explore new authors, from new places. I think of it as a worldtrip in books. What a great idea! I'm looking forward to the challenge and the opportunity to explore other countries! I love this idea! Thanks for hosting! Hi everyone! Great to see that we are more than a dozen readers now. Looking forward to shared reading & reviews. Please leave a note in the comments there when you blog about the book you read, i will do a roundup at the start of February and gather books and links. Great challenge and a fantastic way to get to know new authors, new cultures, new world views. p.s. I sent you an email a while back about Worlds Apart. Since I didn't hear back from you I imagine I must have sent it to an email address that you don't check regularly or the email just got lost. Would you still be interested in me reviewing the book? This is Veena, I am interested in joining this Reading Challenge. Can I join the challenge without a blog? Hello Veena ~ yes, of course, please join. are you at Goodreads or at another bookpage where you add reviews? then you could link there - or just comment in the posts for each step. and hi Brigita ~ i will write a mail back. sorry that something seems to have gone wrong with your mail. I'm looking forward to this. Have just done Egypt: The Yacoubian Building by Alaa al Aswany. I recommend it. Where do we link our reviews for each category? Hi Booksnyc, you are right, it would be good to have a linky list for each category. Also, there is a resources link list in another post that should be included here - i will go through everything in the next days, and update and add linky lists. Thanks to everyone who joined! I wished this year would have given more time and space for this challenge - due to some work projects i wasn't able to continue the challenge. SORRY for that! I hope December will bring a bit of free time, then i would try and gather reading links in a summary post here in this blog. Sorry again, and i hope you still enjoyed the literary trips into different regions of the world.